Polly Atkin grew up in Nottingham, and lived in East London for several years before moving to Cumbria. Her debut poetry pamphlet ‘bone song’ (Aussteiger, 2008) was shortlisted for the Michael Marks Award, 2009. 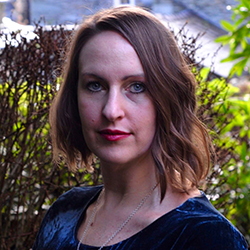 Her second poetry pamphlet ‘Shadow Dispatches’ (Seren, 2013) won the Mslexia Pamphlet Prize, 2012, and was shortlisted for the Lakeland Book of the Year, 2014. Her first full collection, <em>Basic Nest Architecture</em> was published by Seren in February 2017. Her doctorate on the making of meaning around Dove Cottage, Grasmere, was conducted under the AHRC Landscape and Environment project, in collaboration with The Wordsworth Trust, and the departments of Sociology, and English and Creative Writing, at Lancaster University. She is currently completing a monograph expanding this research, exploring the connections between Romantic legacies, contemporary creativity, ecopoetics, tourism and place. She has taught English and/or Creative Writing at Queen Mary, University of London, Lancaster University, University of Cumbria, and Strathclyde University. She is interested in the intersections between visual and literary arts, and poetry as a thing to be stumbled over during day-to-day life, as well as writing about the body, in poetry and prose.